Howdy Paramedic! P.U.N.T.! hunt travelled to the exotic lands of MI and GI today. At MI, we were met with some vicious cougars and SAS. We were able to valiantly fight and got some good experience for our hunting party. We got braver and ventured to GI where we battled a pleisy fearlessly. We needed some seksi assistance so Gremlins came and helped us finish off the pleisy. 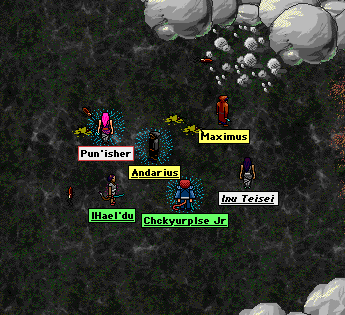 Andarius joined us a few minutes after Gremlins left and after some debate we decided to finish off the GI pit. Half of our team had to go study so four of us ventured to toks. There, Geotzou joined us and we fought until we achieved typical Laughing Academy success as shown in this image. Maximus is laughing in this picture but he fell shortly after too.